All my personalized letter are designs especially for you made to order. Letter are individually stamped, which means, that may not by perfectly aligned. This is what make the piece special and unique and should not be considered a flaw in any way. The ink used in 'blackening' letters may wear off if jewelry over time. Personalized custom jewelry is not refundable. Each jewel will be wrapped in a gift box and ready to gift as a gift. Please read carefully my shop's policy for shipping & return info before making an order. Kabbalah charm Bracelet Two Hebrew initials,Star of David,Evil eye & Hamsa Two monogram, Bat Mitzvah gift, Judaic charm. 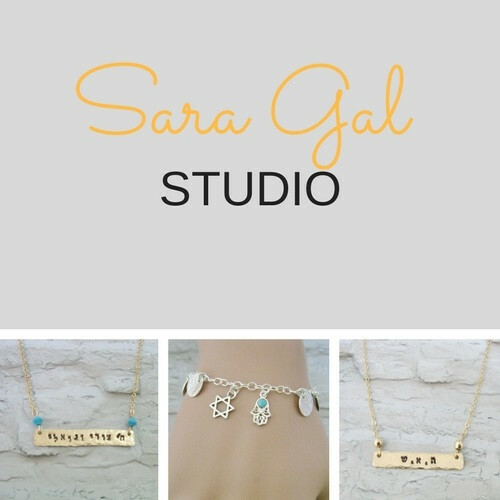 Perfect gift for women Star of David lariat necklace, Bat mitzvah gift, Gold Magen David lariat necklace, by Sara Gal. Infinity 2 two initials Bracelet, Gold filled Infinity & Birthstone Bracelet, Best friend bracelet, Mother/Daughter. Bat Mitzvah gift, Initial Birthstone Necklace, Personalized Birthstone Jewelry, May Birthstone Necklace.